Buy 7 Wonders and PriceWatch, Buy this board game at the Lowest Price. 7 Wonders is a strategy board and card game designed by Antoine Bauza. With the huge influence of the Sid Meier's Civilization computer game series, there have been a few board games that tried to capture its essence. Board games such as Through the Ages have met with success, but have become unwieldy in their effort to capture the entire Civilization experience, with games that can last more than five hours! On the other hand, 7 Wonders is a short and sweet implementation of a civilization game, with mechanics that are easily learned and games that rarely last more than 45 minutes. The game can be played with up to 7 players, which is a rarity in the strategy board game world where most games cater for only 4 or 5 players. Each player starts with the site for one of the 7 Wonders of the Ancient World, which include the Pyramid of Giza, the Hanging Gardens of Babylon, the Colossus of Rhodes, the Statue of Zeus, the Temple of Artemis, the Lighthouse of Alexandria and the Mausoleum of Halicarnassus. The game is pretty simple in design and mechanics, but it does open up a lot of strategic options. Each Wonder also has special abilities that can alter the game. For example, when you complete a stage of the Mausoleum, you can search through the discard pile and build a structure for free. Your strategies will also change depending on which Wonders are on the table and which ones are being used by your direct neighbors. The resources you collect and the structures you build will also depend on your neighbors and their resource pool. You could obtain lots of resources and force your neighbors to keep paying you for trades (every 3 coins is also worth 1 victory point), or you could rely on your neighbors' resources and use the turns to build more important structures rather than getting resources. The goal of the game is to earn the most victory points by the end of 3 ages. These points can be obtained via military, scientific, commercial or civilian means, as well as by constructing your Wonder. There are 3 ages in the game, each of which lasts 6 turns which are carried out in a drafting format. At the start of each age, each player receives an age-specific hand of 7 cards. These cards contain everything in the game, from resources to buildable structures. Each player simultaneously chooses which card they want to play, then passes the remaining 6 cards to the player on his left. Everyone reveals the card they have chosen, and resolves the effects. The next turn then begins and each player now chooses from among the 6 cards passed to him by the player on his right. This continues until turn 6, when you only get to choose between 2 cards. Once the turn ends, the next age begins with another fresh hand of 7 age-specific cards, and you change the directions in which you pass the cards. There are 3 types of actions you can do with the cards you choose each turn. Firstly, you can discard the card to gain 3 coins. Secondly, you can use the card as a foundation for one stage of your Wonder, paying the stated costs of the Wonder stage. Thirdly, you can play the card you chose. There are various cards in the game, ranging from resource cards to military, commerce and civil cards. Each card will have a resource cost that must be met. For example, if a card has a cost of 2 clay and 1 papyrus, you will need to have access to that specific amount and type of resource. Some cards have a prerequisite structure, which means that you can play it for free if you have already built its prerequisite. Each card (as well as each stage of your Wonder) has different effects that will help you gain victory. The brown Raw Materials cards and the gray Manufactured Goods cards are your resource cards. Raw Materials include wood, stone, clay and ore, while the Manufactured Goods include papyrus, glass and textile. The green Scientific cards provide you with victory points at the end of the game, but in an exponential fashion. There are 3 icons that these cards represent. Collect 1 copy of an icon, and you get 1 point. Collect 2 copies and you get 4 points, get 3 and earn 9 points etc. In addition, each set of 3 different icons also nets you 7 points. Then there are the blue Civilian cards that provide you with raw victory points, and the purple Guild cards that give you victory points depending on certain conditions, such as number of resources or military might. These Guild cards are like the 6-cost Development cards in Race For the Galaxy. The remaining 2 card types – the yellow Commercial cards and the red Military cards – involve interacting with your neighbors. In 7 Wonders, you only interact with the players sitting directly beside you. There are 2 ways to interact: trade and military conflicts. When you are building a structure and a neighbor owns resources that you lack, you can pay them 2 coins per traded resource. Commercial cards can either reduce this cost or provide you with the resources some other way. Military conflicts are a means of earning victory points, and the Military cards increase your might towards that end. At the end of every age, you compare your might with each of your neighbors. If you are stronger than your neighbor, you gain military victory points (1 point for age 1, 3 for age 2, and 5 for age 3). If you are weaker, you gain 1 negative point. Nothing changes if there is a tie. Since Science victory points increase exponentially, it becomes an all-or-nothing gambit and you will have to adjust your strategy if too many other players are going down that path. If you don't invest in military, not only are you forgoing military victory points, you may also be giving your neighbors easy points for little investment. You can also play a denial game, discarding or using cards that are useful to other players. If there is an arms race happening on the other side of the table, you could discard a highly sought after Military card rather than let it reach those players, hoping that a stalemate there will end up in your victory. 7 Wonders is a great filler game that can be played in half an hour. Since turns are taken simultaneously, you also don't sacrifice speed when you play with 7 players. And even though the game mechanics is pretty straightforward and easily learned, it still manages to capture the feel of civilization-building and the tug-of-war with neighboring civilizations. 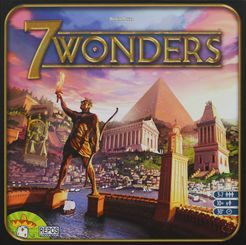 You will like 7 Wonders if you like other civilization games such as Through the Ages or card drafting games such as Dominion.